A rare micrograph of the contractile vacuole and intact contractile vacuole pore membrane of Euplotes. Close examination at high magnification reveals the organization of microtubules lining the pore itself. 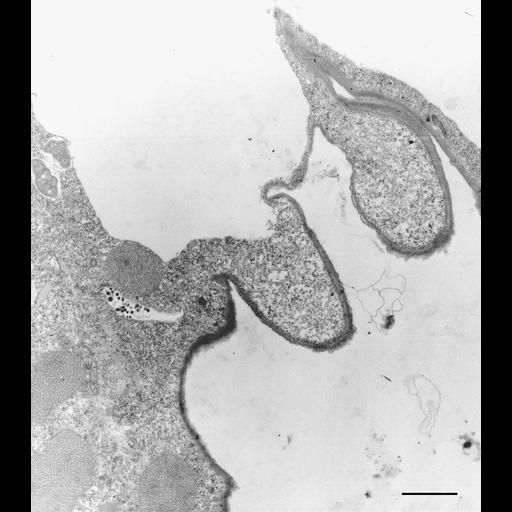 The contractile vacuole is to the upper left on this micrograph; outside the ciliate is to the lower right. Standard glutaraldehyde fixation followed by osmium tetroxide, dehydrated in alcohol and embedded in an epoxy resin. Microtome sections prepared at approximately 75nm thickness. TEM taken on 7/29/67 by R. Allen with Philips 200 operating at 60kV. Neg. 9,000X. Bar = 1µm. A print of the negative was scanned and processed in Photoshop. This image is best used for qualitative analysis. A high resolution image (CIL:9807) is available for quantittative analysis. Additional information is available at (http://www5.pbrc.hawaii.edu/allen/).